If you have any questions or would like more information about moving with children please Contact Us. Moving can be a challenge for anyone, even for your children. Some children might be frightened by the prospect of moving, but, with your care, guidance and positivity, the process of moving with your children will be enjoyable for them. No matter what age your children are, clear communication is needed between you and your child, as well as being receptive to their feelings, moods and actions. Children can be emotionally fragile, so a great deal of patience and care will be needed to address their needs. There’s nothing wrong with including your children, if feasible, in the home buying process – they might enjoy the idea of moving more. If they like a certain bedroom or the backyard, remember to take that into account when purchasing a new home. 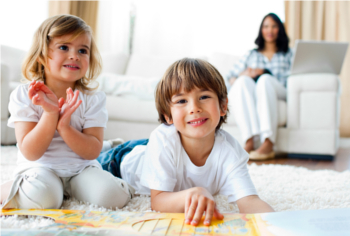 For children, moving can be a reluctant experience, but getting your child involved and having clear communication with them can help smooth over any uneasy feelings and frustration. Once the decision to move is finalized, make sure you communicate this immediately to your children. This will soften the transition by allowing for the necessary time the child requires to prepare for the move. By doing this, your child feels well informed and trusting of you. But also remember, children – especially teens – are ingrained in their social circles, so if they are old enough, allow them spend as much time as they can with their friends. If your child is a toddler or a young elementary school student, the idea of moving might be confusing for them, so this is where parents must take more time and effort to ease the transition for their child. Explain to them carefully what moving means, and maybe use toys or a cheerful story to comfort the child rather than alarming them. The Internet is a great tool to use to show your child images of the new area. If not too far away, physically take your child to your new home and neighborhood so they fully understand their new surroundings. As well, take your child, whether they are young or a teen, to their new school and community center to meet a teacher or a local sports coach. If older, take your child to the local mall, library and movie theatre so they know what social spots are good to go to. The best thing you can do is to be completely open with your child; this is a large transition for them and you need to be as caring and understanding as you can. Moving is extremely stressful for parents when the load of the work is on their shoulders. You will be stressed and will show it, but make sure you don’t expose this to your children – it will just make them stressed and upset. Be positive, enthusiastic and spend time with your child, this may relieve some of your stress too. Be open to the questions and concerns of your child and take time to discuss it with them. While the easy thing to do would be quickly saying, “Everything will be fine,” and going on your way, you must devote time to comfort your kid. This will not only help them with the transition but may also strengthen the relationship between you and your child. It’s perfectly normal for an older child or a teen to rebel and be angered by the move. They are in a social system that works for them and they don’t want to start from scratch. Moving somewhere new, especially when switching to a new school, can be awkward and difficult for your teen. Instead of arguing with them, open up to their feelings. You may have to endure some yelling and crying from your teen, but keep your patience and composure together. And don’t forget to have your child involved in the moving process, especially with packing and the decision-making process. Reward them with ice-cream, a toy or even a bonus allowance when they help out, this will make them feel better. Making an easier transition for your child is crucial for their comfort and emotional stability. After all, it’s your job as a parent to keep your children happy. With some effort and patience, your child will eventually enjoy the new house, and in no time they will be referring to their new surroundings as “home”. Contact Us and we will help you make the move a smooth as possible.